Beginning with Qt 4.5, a deployment tool is included that automates the prodecures described here. This document describes how to create a bundle and how to make sure that the application will find the resources it needs at run-time. We demonstrate the procedures in terms of deploying the Plug & Paint application that is provided in Qt's examples directory. The bundle provides many advantages to the user. One primary advantage is that, since it is a single entity, it allows for drag-and-drop installation. As a programmer you can access bundle information in your own code. This is specific to Mac OS X and beyond the scope of this document. More information about bundles is available on Apple's Developer Website. This will tell qmake not to put the executable inside a bundle. Please refer to the X11 deployment documentation for information about how to deploy these "bundle-less" applications. We will only concern ourselves with command-line tools here. While it is possible to use Xcode for this, Xcode has changed enough between each version that it makes it difficult to document it perfectly for each version. A future version of this document may include more information for using Xcode in the deployment process. If you want to keep things simple by only having a few files to deploy, then you must build everything statically. Start by installing a static version of the Qt library. Remember that you will not be able to use plugins and you must build in all the image formats, SQL drivers, etc..
You can check the various options that are available by running configure -help. You probably want to link against the release libraries, and you can specify this when invoking qmake. If you have Xcode Tools 1.5 or higher installed, you may want to take advantage of "dead code stripping" to reduce the size of your binary even more. You can do this by passing LIBS+= -dead_strip to qmake in addition to the -config release parameter. This doesn't have as large an effect if you are using GCC 4, since Qt will then have function visibility hints built-in, but if you use GCC 3.3, it could make a difference. 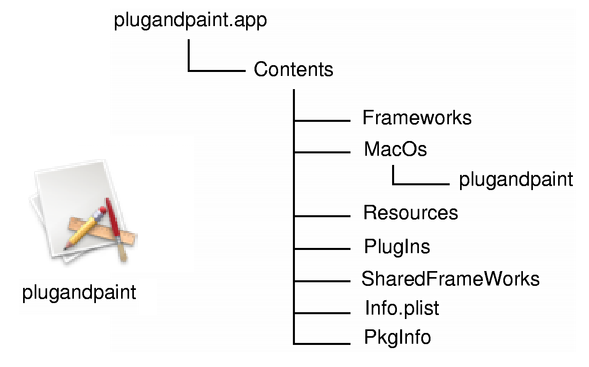 Now, provided that everything compiled and linked without any errors, we should have a plugandpaint.app bundle that is ready for deployment. One easy way to check that the application really can be run stand-alone is to copy the bundle to a machine that doesn't have Qt or any Qt applications installed, and run the application on that machine. For more information, see the Application Dependencies section. The Plug & Paint example consists of several components: The core application (Plug & Paint), and the Basic Tools and Extra Filters plugins. Since we cannot deploy plugins using the static linking approach, the bundle we have prepared so far is incomplete. The application will run, but the functionality will be disabled due to the missing plugins. To deploy plugin-based applications we should use the framework approach. We have two challenges when deploying the Plug & Paint application using frameworks: The Qt runtime has to be correctly redistributed along with the application bundle, and the plugins have to be installed in the correct location so that the application can find them. When distributing Qt with your application using frameworks, you have two options: You can either distribute Qt as a private framework within your application bundle, or you can distribute Qt as a standard framework (alternatively use the Qt frameworks in the installed binary). These two approaches are essentially the same. The latter option is good if you have many Qt applications and you would prefer to save memory. The former is good if you have Qt built in a special way, or want to make sure the framework is there. It just comes down to where you place the Qt frameworks. We assume that you already have installed Qt as frameworks, which is the default when installing Qt, in the /path/to/Qt directory. For more information on how to build Qt, see the Installation documentation. When installing, the identification name of the frameworks will also be set. The identification name is what the dynamic linker (dyld) uses to find the libraries for your application. For the Qt frameworks, the first line (i.e. path/to/Qt/lib/QtGui.framework/Versions/4/QtGui (compatibility version 4.0.0, current version 4.0.1)) becomes the framework's identification name which is used by the dynamic linker (dyld). But when you are deploying the application, your users may not have the Qt frameworks installed in the specified location. For that reason, you must either provide the frameworks in an agreed upon location, or store the frameworks in the bundle itself. Regardless of which solution you choose, you must make sure that the frameworks return the proper identification name for themselves, and that the application will look for these names. Luckily we can control this with the install_name_tool command-line tool. The install_name_tool works in two modes, -id and -change. The -id mode is for libraries and frameworks, and allows us to specify a new identification name. We use the -change mode to change the paths in the application. Let's test this out by copying the Qt frameworks into the Plug & Paint bundle. Looking at otool's output for the bundle, we can see that we must copy both the QtCore and QtGui frameworks into the bundle. We will assume that we are in the directory where we built the bundle. First we create a Frameworks directory inside the bundle. This follows the Mac OS X application convention. We then copy the frameworks into the new directory. Since frameworks contain symbolic links, and we want to preserve them, we use the -R option. Then we run install_name_tool to set the identification names for the frameworks. The first argument after -id is the new name, and the second argument is the framework which identification we wish to change. The text @executable_path is a special dyld variable telling dyld to start looking where the executable is located. The new names specifies that these frameworks will be located "one directory up and over" in the Frameworks directory. Now, the dynamic linker knows where to look for QtCore and QtGui. Then we must make the application aware of the library locations as well using install_name_tool's -change mode. This basically comes down to string replacement, to match the identification names that we set for the frameworks. After all this we can run otool again and see that the application will look in the right locations. If we run otool on for example the Basic Tools plugin's .dylib file we get the following information. The additional code in tools/plugandpaint/mainwindow.cpp also enables us to view the plugins in the Finder, as shown to the left. We can also add plugins extending Qt, for example adding SQL drivers or image formats. We just need to follow the directory structure outlined in plugin documentation, and make sure they are included in the QCoreApplication::libraryPaths(). Let's quickly do this with the image formats, following the approach from above. First, we tell the application to only look for plugins in this directory. In our case, this is what we want since we only want to look for the plugins that we distribute with the bundle. If we were part of a bigger Qt installation we could have used QCoreApplication::addLibraryPath() instead. Warning: When deploying plugins, and thus make changes to the source code, the default identification names are reset when rebuilding the application, and you must repeat the process of making your application link to the Qt frameworks in the bundle using install_name_tool. Now you should be able to move the application to another Mac OS X machine and run it without Qt installed. Alternatively, you can move your frameworks that live outside of the bundle to another directory and see if the application still runs. If you store the frameworks in another location than in the bundle, the technique of linking your application is similar; you must make sure that the application and the frameworks agree where to be looking for the Qt libraries as well as the plugins. When you are done linking your application to Qt, either statically or as frameworks, the application is ready to be distributed. Apple provides a fair bit of information about how to do this and instead of repeating it here, we recommend that you consult their software delivery documentation. Although the process of deploying an application do have some pitfalls, once you know the various issues you can easily create packages that all your Mac OS X users will enjoy. Your application may also depend on one or more Qt plugins, such as the JPEG image format plugin or a SQL driver plugin. Be sure to distribute any Qt plugins that you need with your application, and note that each type of plugin should be located within a specific subdirectory (such as imageformats or sqldrivers) within your distribution directory, as described below. Note: If you are deploying an application that uses QtWebKit to display HTML pages from the World Wide Web, you should include all text codec plugins to support as many HTML encodings possible. Using qt.conf. This is the recommended approach since it provides the most flexibility. Using a third party installation utility to change the hard-coded paths in the QtCore library. The How to Create Qt Plugins document outlines the issues you need to pay attention to when building and deploying plugins for Qt applications. Unlike the deployment processes on X11 and Windows, compiler specific libraries rarely have to be redistributed along with your application. But since Qt can be configured, built, and installed in several ways on Mac OS X, there are also several ways to deploy applications. Typically your goals help determine how you are going to deploy the application. The last sections describe a couple of things to keep in mind when you are deploying your application. From Qt 4.6, Mac OS X 10.3 (Panther) is no longer supported. Qt 4.6 applications can be built and deployed on Mac OS X 10.4 (Tiger) and higher. This is achieved using weak linking. In weak linking, Qt tests whether a function added in a newer version of Mac OS X is available on the computer it is running on. This allows Qt to use newer features, when it runs on a newer version of OS X, while remaining compatible on the older versions. For more information about cross development issues on Mac OS X, see Apple's Developer Website. to your .pro file, and qmake will take care of this for you. If you build your Qt 4.6 Phonon application on OS X 10.4 (Tiger), it will run on OS X 10.4 and higher. From 4.1.1 the Qt binary package is already universal. If you want to create a binary that runs on older versions of PowerPC and x86, it is possible to build Qt for the PowerPC using GCC 3.3, and for x86 one using GCC 4.0, and use Apple's lipo(1) tool to stitch them together. This is beyond the scope of this document and is not something we have tried, but Apple documents it on their developer website. Besides lipo, you can also check your binaries with the file(1) command line tool or the Finder. The Mac deployment tool can be found in QTDIR/bin/macdeployqt. It is designed to automate the process of creating a deployable application bundle that contains the Qt libraries as private frameworks. Debug versions of the plugins are not deployed. The designer plugins are not deployed. The Image format plugins are always deployed. SQL driver plugins are deployed if the application uses the QtSql module. Script plugins are deployed if the application uses the QtScript module. The Phonon backend plugin is deployed if the application uses the Phonon module. The svg icon plugin is deployed if the application uses the QtSvg module. The accessibility plugin is always deployed. Accessibility for Qt3Support is deployed if the application uses the Qt3Support module. Note: If you want a 3rd party library to be included in your application bundle, then you must add an excplicit lib entry for that library to your application's .pro file. Otherwise, the macdeployqt tool will not copy the 3rd party .dylib into the bundle.